First things first, we had to order our tea. Normally with afternoon tea, I always go for English breakfast, but I was so thirsty that this time I went for a fruitier choice. I had lemongrass and ginger, whereas Natalie chose the blackcurrant and hibiscus tea. Both were delicious and came in the cutest and exclusive Pret-a-Portea china (for those that may be interested, it's £60 per cup if you want to take the china home with you!!!). We were then left to peruse the menu. As you can probably guess from the name and the menu, the Pret-a-Portea is inspired by the world of fashion and is updated every season to match what is current. All of the cakes and pastries are hand-crafted and inspired by current and on trend designs. We were lucky when we visited as the menu had just recently been changed to suit SS '15, I couldn't wait to see what we would get. First to arrive were the sandwiches. We had requested to not be given anything with smoked salmon but it didn't affect the variety of choice that we were given and they were all absolutely delicious...and refillable so we had two plates, although I couldn't manage the second! We had ham on beetroot bread, mozzarella, pesto and tomato, coronation chicken, beef and rocket and egg mayonnaise. They were so tasty and I savoured every last bite! Next we were given a plate of savouries which I really wasn't expecting having never had them at an afternoon tea before. These were also refillable but we wanted to save room for cake. I particularly enjoyed the beetroot and yoghurt savoury (in the shot glass) and the little piece of fresh tuna. I wasn't keen however on the ham tagine or the crab meat savouries; there wasn't anything wrong with them they just weren't to my liking. It was a nice change though, bravo to The Berkeley! Now, for the best part, the cakes! Our waiter talked us through the menu (see above) and showed us which cake related to which designer and told us exactly what was in each cake. It was the most interesting introduction to cakes I've ever had and the cake stand was absolutely beautiful and awash with exuberant colours. It was almost too pretty to eat!! Cue lots of photos that will make your mouth water! 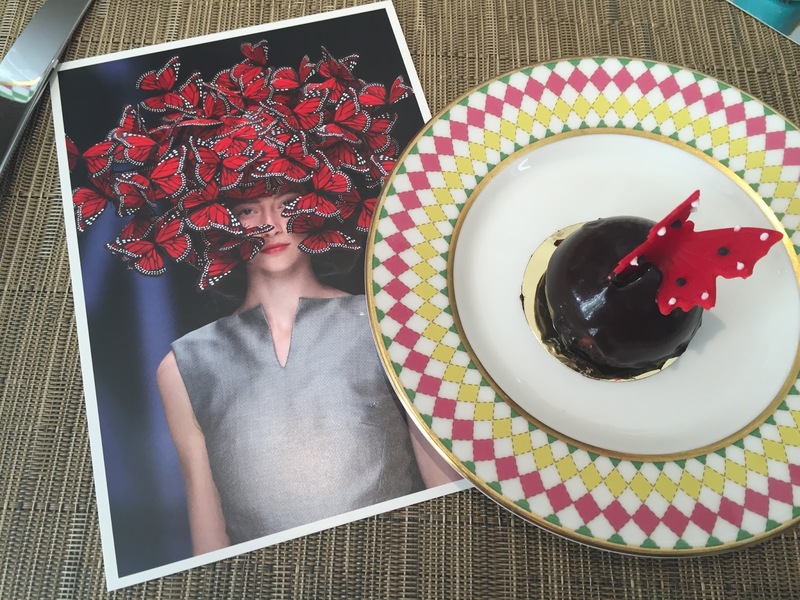 I loved the Anya Hindmarch handbag, which tasted like a delicious mini blueberry muffin and I was really excited about the addition of the Armadillo shoe and the butterfly cake in honour of Alexander McQueen's exhibition. The tastiest though had to be the Jean Paul Gaultier inspired Creme de Menthe cremeux which was delicious. I love mint, so this little beauty was right up my street. Natalie had the other little glass which was topped with passionfruit which she said was equally delicious. In fact all of the cakes were and we managed to eat them all, although I was fit to burst afterwards! Our afternoon was exceptional and well worth its £45 per person price tag. There was so much food and unlimited tea and we were even given a little box of pastries to take home with us in the cutest little handbag box...definitely a fitting little extra. We had such a lovely time and I'd definitely go back and do it all again, it was absolutely fabulous. I love fashion and I love cake, so this was the perfect combination and it was amazing to share it all with my best friend! Funny story alert!! Just to finish on an anecdote, when we got to Kings Cross our cakes had started to melt a little, so we slid them into a bin bag that one of the Kings Cross employed rubbish collectors was carrying around. She recoiled in horror that we were throwing these cakes away, but they had started to melt and really wouldn't have survived the long journey home. I just have to point out here that these cakes touched the bottom of the bag, and also that she was working at Kings Cross and was by no means starving or homeless. She then proceeded to eat the cakes we had thrown away out of her bag!!!!!! We were horrified, but I guess it just goes to show how good the cakes from the Berkeley really are!! Worthy of being eaten out of a bag full of rubbish? Certainly...apparently! Afternoon Tea at The Berkeley starts at £45 per person and must be booked in advance. You can book yours here. Love that a bin diver ate your cakes ... brilliant! This afternoon tea is an absolute beauty, all the colours! It's so well designed and looks absolutely delicious! I think I would have been tempted to buy one of those cups and saucers too, they're stunning and would look rather lovely in our new kitchen!